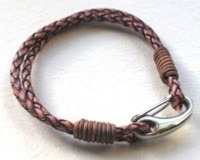 Sterling Silver Bracelets, Gemstone Bracelets and Leather Bracelets. 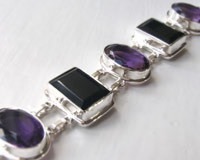 A gemstone bracelet makes a perfect birthstone gift. Our gemstone bracelets collection includes more than 20 different semi-precious gemstones. All your favourite gems are here from the regal purple of amethyst bracelets to the iridescent glow of moonstone and labradorite bracelets. For maximum colour impact, try out our agate bracelets and for elegant serenity, our black onyx bracelets are just the ticket. 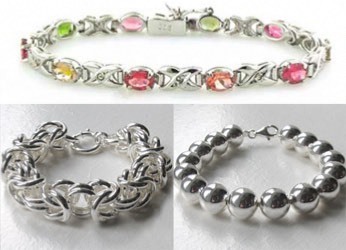 Italian Sterling Silver Bracelets, Bangles and Cuffs. 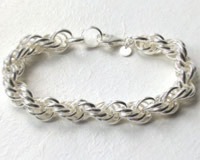 Our sterling silver bracelets range encompasses everything from a sleek silver snake bracelet to intricate link bracelets such as our silver byzantine bracelet. Match your silver bracelet with one of our silver chains.